This study involves the determination of the effect of pineapple (Ananas comosus) peel extract, (with and without salt), on fabrics stained with grease, ink, hair dye, deodorant, mud,and rust. An 8" X 9" cotton white cloth was used. The fabricwassmeared with the 0.01 g stain in the center, (except for the deodorant where 4 strokes were applied). The different stained fabrics were setaside for 10 hours, after which were treated with 5 grams each of Clorox, and pineapple extract (with and without salt) for 10 to 20 minutes. This study was limited to the conduct of visual observation. The ranking test was considered to determine the degree of preference of stain removed. 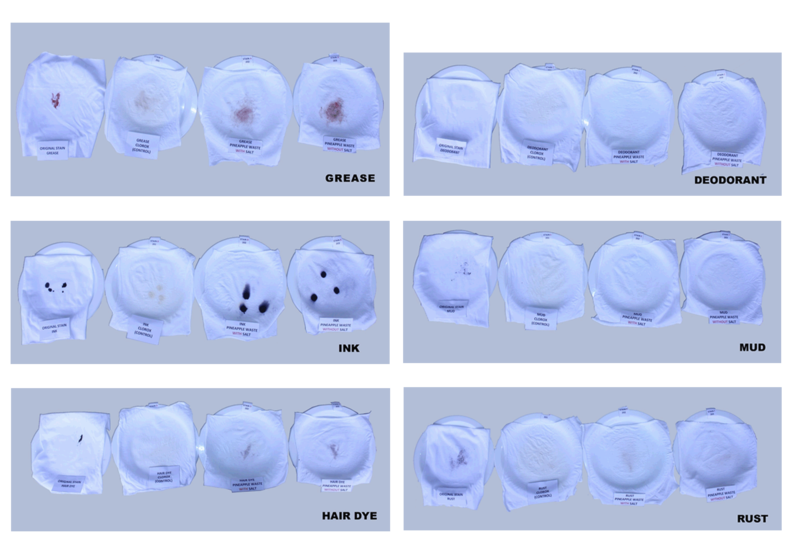 Results showed that removal of stains depends on the possible reaction of specified stain againstthechemical composition of anti-stain solutions used. The effect of the above three solutions gave significant effect as stain removal. Commercially available Cloroxwasused as the control. This was able to reducemost of the above stains. However, the degree of reduction depends on the stain. Pineapple waste extract (acid) and salt (sodium chloride) were effective against rust, mud,and deodorant. The effect of the fabric whitening was not noticeable from the three stain removal solutions due to the spread of smears contributed by different stains in the fabrics.